Our forth chapter in the Japanese section is even more unique. 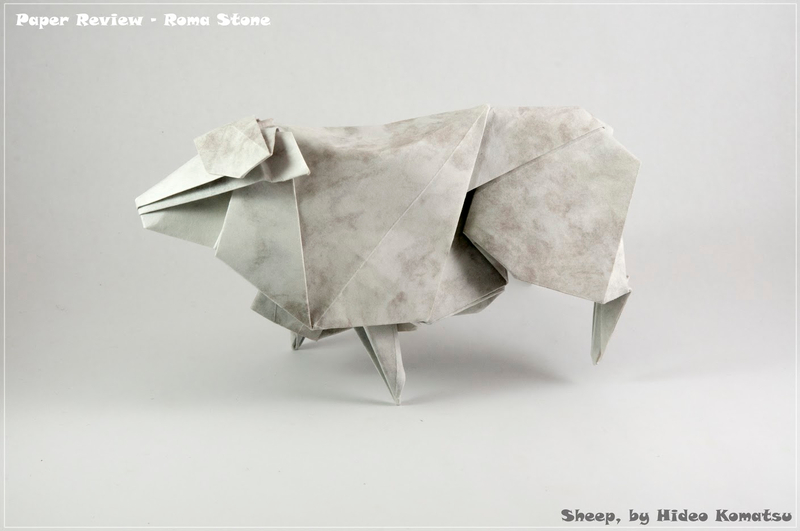 As its name suggest, Roma Stone (ローマストーン) aka French Marble looks like marble and it is the heaviest paper we tested so far. 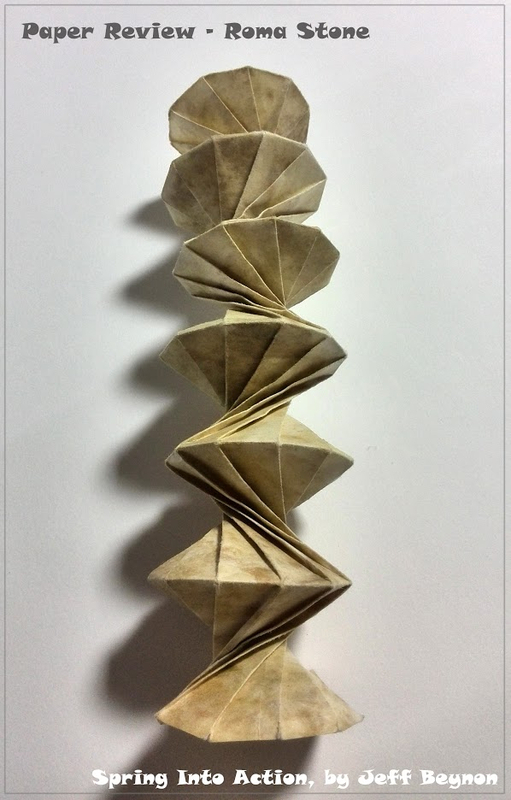 Manufactured in Japan, this is yet another contribution from Takeo to the origami community. As with the other Japanese papers, we completed this review based only on the laboratory tests and our own hands-on experience. You really need to think before folding with this paper. Which model most benefits from the texture - and can it be folded from 120gsm paper? We realised once again that neither traditional models nor complex are good candidates, so this review will focus on the intermediate models. Thickness: The paper weighs 120gsm and has a thickness of 128 microns. For comparison, Sato Gami weighs 80gsm and is 126 microns thick. This explains the stony feeling you get with this paper – it’s extremely dense. Its weight to thickness ratio is 0.9375, Elephant Hide has a ratio of 0.815. The only paper with a higher density is Glassine, which is made to be as flat as possible. Sizes: You can find full sheets at 109.1cm × 78.8cm, as well as pre-cut squares with a side length of 70cm, 35.6cm (14in), 35cm, 24cm or 23cm (9in). Colors: Four shades are available: grey, light grey, yellowish and light yellowish. This collection of colours is highly suitable for the stony texture. Paper Coloring or Colorability: As this paper is all about its texture, we did not try to color it. 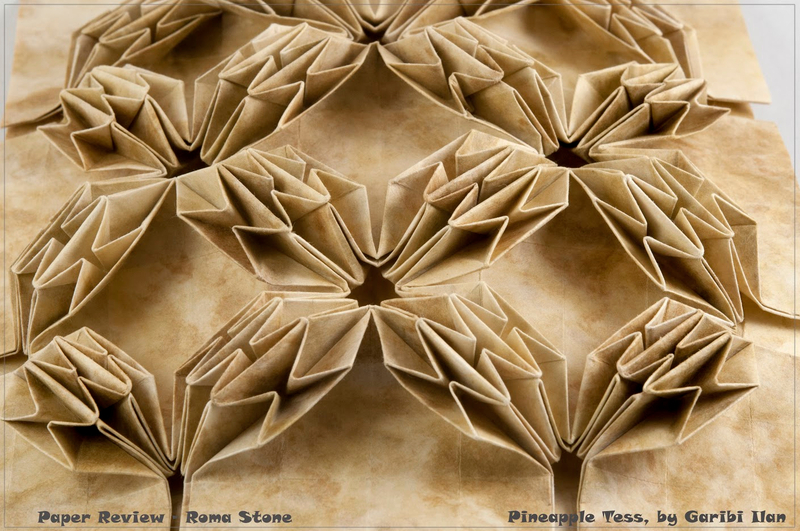 Texture: The names Roma Stone and French Marble (as it’s called on origami-shop.com are true to the nature of the paper. It looks like marble, it feels smooth like marble, and while it's not as dense as stone, it does give a sense of high density. Each sheet is unique, as it is colored with a random pattern of heavy, smoky clouds. The paper is probably only colored on one side, as one side has livelier colors and the texture is vaguer on the reverse. Photogenic: The paper is a real beauty. With the right light you can capture its special texture easily and present unique images. Aging and Wear and Tear: Surprisingly, this paper scored in the area of 800, similar to Tant (which weighs only 75% of Roma Stone). We do not have any experience with aging or color fading. 7 out of 10. Memory: This is one of the paper's virtues. Creases are sharp and evident. The paper behaves almost like foil. 9 out of 10. 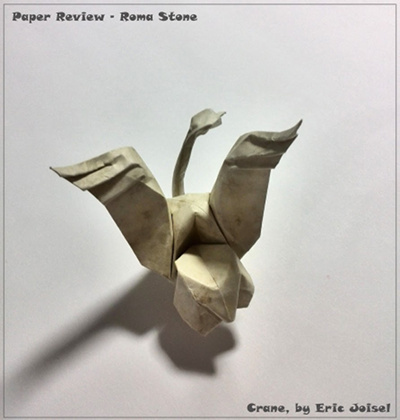 Forgiveness: In this respect, Roma Stone is one of the best papers we've tested so far. Reversing a fold is done effortlessly and accurately. 9.5 out of 10. Tensile Strength: We refer here to the maximum stress the paper can undergo while being stretched or pulled. In our tests we needed almost 13 kg to tear it with the grain. The paper stretched by 1.7mm. Against the grain the numbers are less impressive - 6.6 kg before it tore and it stretched by an incredible 12.2mm! 8 out of 10. Bending Resistance: This section rates the amount of force you need to apply to get a sharp crease and how strong the paper is while being curved. The results, 107 and 216, are just a little lower than those of Stardream (128 / 216), which has the same weight. 9 out of 10. 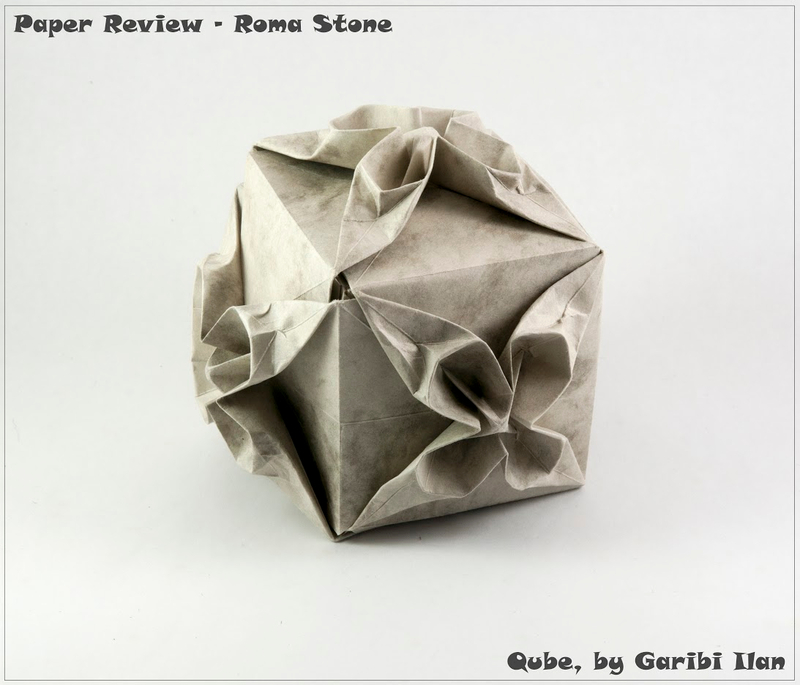 Roma Stone is springy, but far from perfect for action models. This model need a strong, springy paper, so Roma Stone seemed perfect for it. The paper got sharp creases and it was easy to add the straight and diagonal fold lines. The same goes with reversing a fold line. While collapsing the model, I noticed that thee thickness was becoming an issue and to close it well, I had to stretch the paper. This was also the reason it didn't operate as nicely as I hoped it would. Great for tessellations, it allows a fast collapse. When folding the 26 division grid you immediately get the sense of this paper – it is thick and strong. I highly recommend using a bone folder, I felt my muscles when I finished. Reversing the long fold lines is a joy. The paper breaks on the spot, but you still need to enforce the crease in the other direction, again, with a bone folder. Pre-creasing on the color side is hard. Due to its texture the fold lines are camouflaged and hard to see. Each crease created a ridge on the reverse, so there it was much easier to see all the creases. Collapsing a thick paper can be disaster; thick layers interfere and shaping can be prevented by low flexibility. This is not the case with Roma Stone, the first phase of the collapse went in a blaze. The paper snaps into place and stay there. The second phase is usually harder, as you have to gather many layers and all inner molecules are hard to manipulate. Not with this paper! This may be the only time ever I collapsed this model just by pushing in from all sides. With a little nudge here, and a finger there all molecules popped into place. Amazing! It was done in less than five minutes, usually it takes me ten to fifteen! Strangely enough, the finished model doesn't look as nice as after the first stage of the collapse. Before the second collapse there were larger surfaces visible, which nicely showed of the paper's unique texture. After the second collapse it's not as evident anymore. Roma Stone allows you to fold big and sturdy modular projects. Simple folds like this model are done easily, but a bone folder is a necessity. I collapsed the unit only after finishing all the precreasing, as it's hard to force a new crease onto a folded model accurately. Shaping the bloomy part was easy and the paper with its extreme bending resistance keeps its shape like aluminium foil! When assembling the units, I enjoyed the stability that is created by Roma Stone's thickness. It's easy to do 3D shaping. Although the recommended size is 15cm, I used a larger sheet. It took me 15 minutes to finish it, with nothing slowing me down. The creases are sharp and accurate, since this model has little layering. The final steps show the strength of the paper – it was very easy to shape the puffy tail. I just had to make the right creases and the paper stood still in the last position I had put it into. The final model is highly stable and beautiful! Roma Stone is a paper for low complexity models. 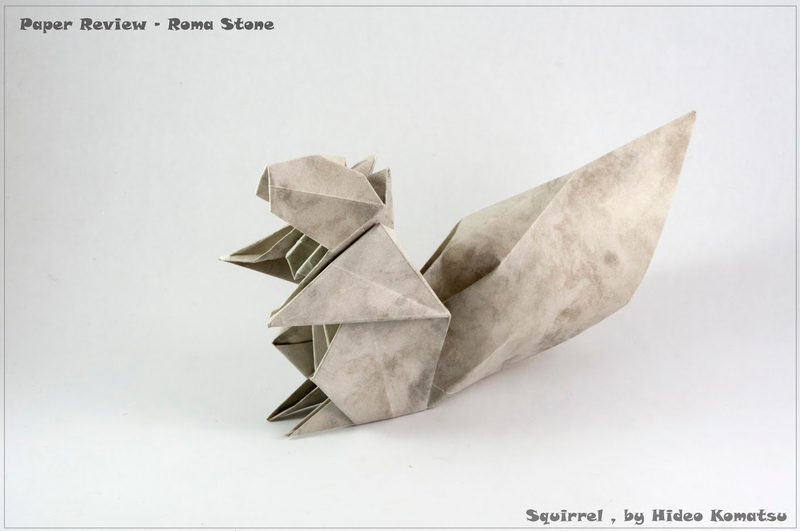 This is the first model I ever folded with Roma Stone. The paper suits the sheep perfectly. The light grey color and the unique texture look just like sheepskin. The creases are so sharp that they can be seen and felt easily. Roma Stone's memory is almost like folding with metal, the paper stay in the position it's put, jumping back only very little. On the down side, once layers add up - even just four - the paper's thickness becomes a problem. Reversing folds was not as easy as I anticipated. The same goes with the closed sink step – I thought it would be easy and on the spot, but while reversing you have to look for the crease line on the other side to make sure it breaks there. Step 92 asks for manipulation of 12 layers, and this is too much for the paper. It is impossible to keep all edges aligned. The lock is very strong, and the final model stands firm. I am very happy with the results. It's easy to achieve curves and volume. This is a 3D variation on a very classic model. Joisel used some unique techniques to create the 3D parts and paper with a high bending resistance is perfect for these folds. Roma Stone reacted beautifully, even on the neck with its many layers. Shaping the details in the last steps was done with ease and to my utmost satisfaction. There is no need to wet the paper to get the right curves. The texture can really complement models! This is a very strong paper, and no added strength (with MC, for example) is needed. I liked the way the creases form – sharp and easy to reverse. I also liked the texture that goes really well with this model; grayish white, with a look similar to marble. I managed to shape the skull easily. This is the strongest paper we tested so far. With 120gsm it is as heavy as Stardream, but it feels much stiffer. Add this to the unique texture and you get an extraordinary paper, suitable for more models and genre than you would expect. 3D models and intermediate to low complex are perfect candidates. We all loved the results we could achieve with such models and enjoyed especially the shaping part – it is just like folding foil. Tessellations, if not too small or overlapped, will benefit from the stiffness and springiness of Roma Stone. We even got good results with modulars, with no more than 10 units, though. The paper is too strong to fold 30 units in a row, but if you want to have a BIG Sonobe ball, that will hold its weight and stay firm – this is the paper for you! We didn't even try to fold complex or simple models. There is no need to waste time or paper on such attempts, which are doomed to fail. We also skipped the wet folding test, since we could get the same results without wetting the paper. Our flickr search reveals how much under the radar this paper is, I only found two models, which are folds of 3D animals. Perhaps that will chance after this review. 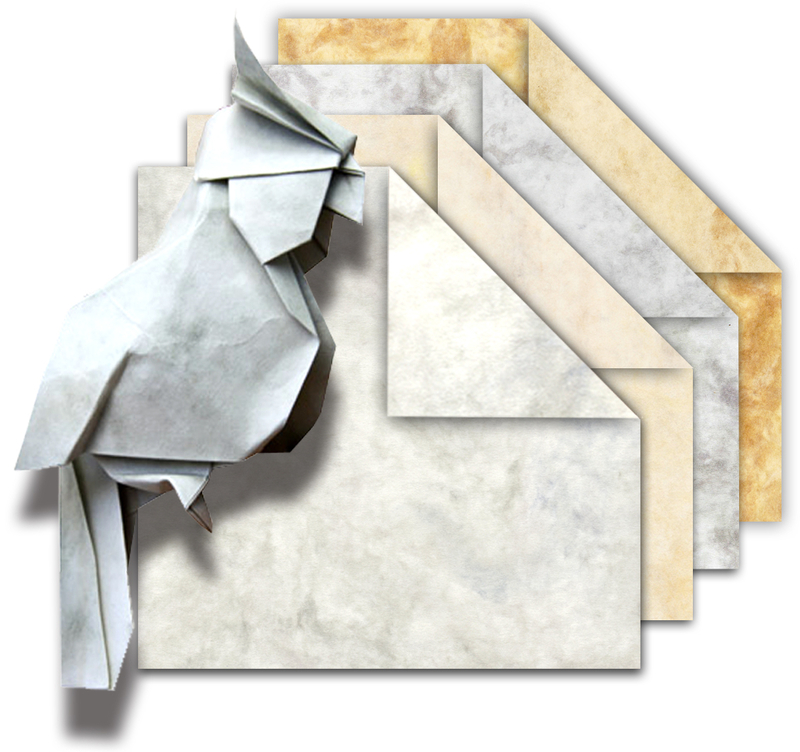 When marble-like texture and unique strength are needed, this is the perfect paper. 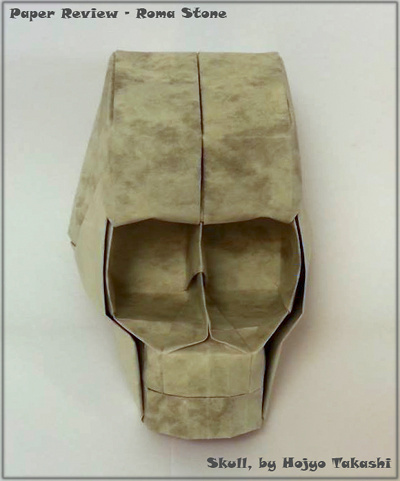 Yes, the color palette is limited, but for the right model, this paper is on the spot! Bottom line: beautiful and strong!